we stayed on track and kept moving forward. 국동은 지난 50년간 섬유보국(纖維報國)에 힘써 왔습니 다. 수출업계에 1천만불 탑 수상자가 가뭄에 콩 나듯 했던 1984년 무역의 날에 2천만불 탑을 수상한 후 매년 국무 총리 표창, 내무부장관 표창, 대통령산업포장 등 받았고 1996년에 5천만불 수출탑과 함께 철탑산업훈장을 수상 하는 등 경상수지 흑자에 기여해 왔습니다. 글로벌 경영 능력과 세계 시장을 조망하는 능력을 바탕 으로 의류 수출 경영 대가(大家)의 명성을 공인 받아 2017년 제31회 섬유의 날 동탑산업훈장을 수상하였습니다. 또한 섬유 패션 관련 국내 최고 권위의 삼우당 대상은 목면 산업의 씨앗을 뿌려 의생활 혁명을 일으킨 고려말 문신 문익점 선생을 기념하기 위해 그의 호 ‘삼우당’을 본 따 만든 상으로서 국내 패션·섬유 업계의 노벨상이라고도 불리고 있습니다. 2015년 삼우당 섬유패션 대상을 수상 한 데 이어 2017년 우리나라 니트의류 수출강국을 위해 평생을 헌신해 오신 변효수 명예회장님께서 공로상을 수상하셨습니다. Kukdong has been working in the textile industry for over 50 years. To have a recipient of the $10 Million Export Tower Award for the industry was a rare occurrence in 1984, yet we received the $20 million Export Tower Award on Trade Day of 1984. Since then, Kukdong has received the Prime Minister's Commendation every year, the Minister's Award from the Ministry of Internal Affairs and the Presidential Industrial Citation. In 1996, Kukdong received the $50 Million Export Tower Award as well as the Iron Tower Industrial Medal and contributed to current account surplus. Based on our global management experience and our ability to view the world market, we received the 31st Annual Bronze Tower Industrial Medal in recognition of being the front-runner in garment export management. In 2015, Kukdong won the 22nd Samwoodang Textile Fashion Grand Prize, the most prestigious citation in the field of textile fashion in Korea. The late Honorary Chairman, Mr. Hyosoo Byun, who had dedicated his entire life to making Korea a strong knitwear exporting country, was awarded, posthumously, the Lifetime Achievement Award in 2017. 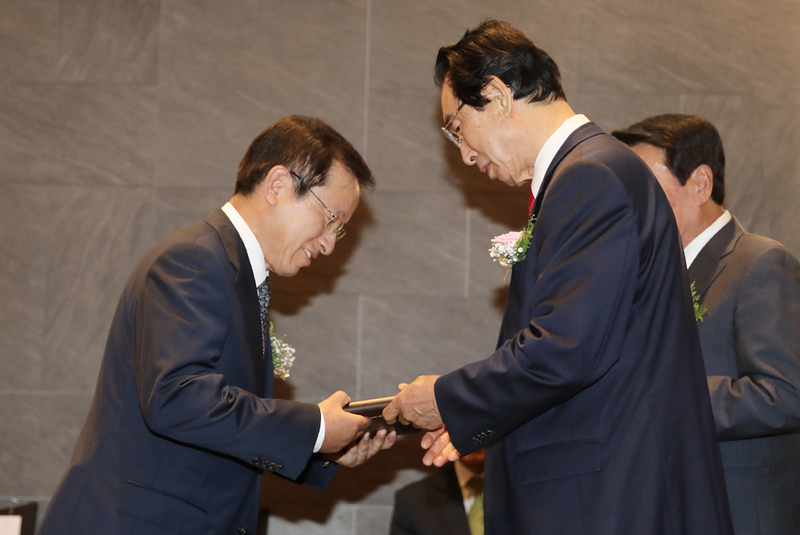 President Jung-kyu Kim accepted the award on behalf of the late Honorary Chairman Hyosoo Byun. 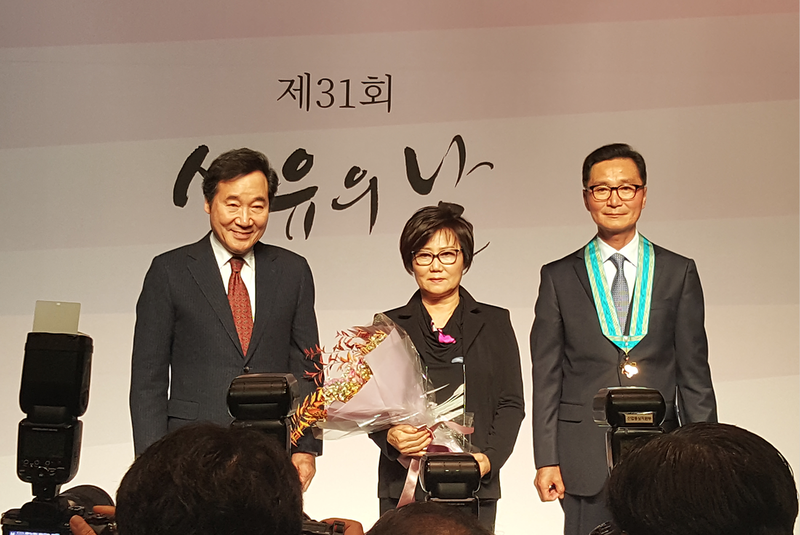 Yong-il Cho, an international textile newspaper publisher, bestows the Samwoodang 22nd annual Textile Fashion Lifetime Achievement Award to President Jung-kyu Kim on behalf of the late Honorary Chairman Hyo Soo Byun. 국동 변상기 회장 내외가 동탑산업훈장을 수상한 후 이낙연 국무총리와 기념사진을 촬영하고 있다.